Apple today unveiled MacBook Air at Macworld, which they describe as the world‚Äôs thinnest notebook. MacBook Air measures 0.16-inches at its thinnest point, while its maximum height of 0.76-inches is less than the thinnest point on competing notebooks. MacBook Air has a 13.3-inch LED-backlit widescreen display, a full-size and backlit keyboard, a built-in iSight video camera for video conferencing, and a spacious trackpad with multi-touch gesture support so users can pinch, rotate and swipe. MacBook Air is powered by a 1.6 GHz or 1.8 GHz Intel Core 2 Duo processor with 4MB L2 cache, and includes as standard features 2GB of memory, an 80GB 1.8-inch hard drive, and the latest 802.11n Wi-Fi technology and Bluetooth 2.1. MacBook Air has a vibrant 13.3-inch LED-backlit glossy widescreen display that is energy efficient, and its spacious trackpad offers multi-touch gesture support for pinch, rotate and swipe, making it more intuitive than ever to browse and rotate photos or zoom into web pages in Safari‚Ñ¢. MacBook Air features a full-size keyboard design in a sleek and durable aluminum enclosure. The backlit keyboard makes it ideal for dimly lit environments such as airplanes, studios or conference halls, and a built-in ambient light sensor automatically adjusts the brightness of the keys as well as the display brightness for optimal visibility. MacBook Air delivers up to five hours of battery life for wireless productivity and includes AirPort Extreme¬Æ 802.11n Wi-Fi networking, which delivers up to five times the performance and twice the range of 802.11g*. Apple‚Äôs Migration Assistant software now enables users to quickly transfer files, applications and preferences from your old Mac¬Æ to MacBook Air right over your wireless network. MacBook Air users can buy the companion MacBook Air SuperDrive, a compact external drive designed for MacBook Air, for just $99. The MacBook Air SuperDrive¬Æ is powered by MacBook Air‚Äôs USB port, eliminating the need to carry a separate power adapter. Many MacBook Air users will not find a need for an optical drive now that they can wirelessly rent movies from the iTunes¬Æ Store, wirelessly backup files with Time Capsule and access the optical drives on remote PCs or Macs to wirelessly install software applications on MacBook Air. MacBook Air is powered by Intel Core 2 Duo processors running at 1.6 GHz or 1.8 GHz, and includes as standard 2GB of memory and an 80GB 1.8-inch hard drive. An optional 64GB solid state drive contains no moving parts for added durability. Every MacBook Air includes a micro-DVI port so users can connect to Apple‚Äôs gorgeous 20-inch or 23-inch Cinema Displays to extend their desktop or connect to projectors and other displays via DVI, VGA, Composite and S-video adapters. MacBook Air includes USB 2.0 for plugging in peripherals or charging an iPod¬Æ or iPhone‚Ñ¢, a headphone jack and Apple‚Äôs acclaimed MagSafe¬Æ Power Adapter designed especially for mobile users. Every MacBook Air comes with iLife¬Æ ‚Äò08, the most significant update ever to Apple‚Äôs award-winning suite of digital lifestyle applications, featuring a major new version of iPhoto¬Æ and a completely reinvented iMovie¬Æ, both seamlessly integrated with the new .Mac Web Gallery for online photo and video sharing. The new MacBook Air also comes with Leopard‚Ñ¢, the sixth major release of the world‚Äôs most advanced operating system. Leopard introduces Time Machine‚Ñ¢, an effortless way to automatically back up everything on a Mac; a redesigned Finder that lets users quickly browse and share files between multiple Macs; Quick Look, a new way to instantly see files without opening an application; Spaces, an intuitive new feature used to create groups of applications and instantly switch between them; a brand new desktop with Stacks, a new way to easily access files from the Dock; and major enhancements to Mail and iChat¬Æ. .Mac members can use the new Back to My Mac feature to browse and access files on their home computer from a MacBook Air over the Internet while out on the road. 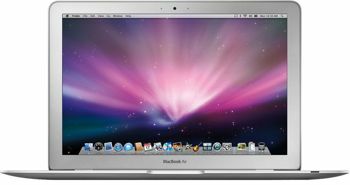 The new MacBook Air embodies Apple‚Äôs continuing environmental progress with its aluminum enclosure, a material highly desired by recyclers; Apple‚Äôs first mercury-free LCD display with arsenic-free glass; and brominated flame retardant-free material for the majority of circuit boards as well as PVC-free internal cables. In addition, MacBook Air consumes the least amount of power of any Mac, and its retail box, made primarily from 100 percent post-consumer recycled material, is 56 percent smaller by volume than the previously smallest MacBook packaging. Build-to-order options and accessories include the ability to upgrade to a 1.8 GHz Intel Core 2 Duo processor; 64GB solid state drive, MacBook Air SuperDrive, Apple USB Ethernet Adapter, Apple USB Modem, Apple MagSafe Airline Adapter, Apple Remote and the AppleCare Protection Plan. Additional build-to-order options also include pre-installed copies of iWork ‚Äò08, Logic¬Æ Express 8, Final Cut¬Æ Express 4 and Aperture‚Ñ¢ 1.5.